Although Charleston is proud of its time-honored traditions and the classic shapes of its architecture, the city has also been known for its non-conventional spirit. Local artist Lese Corrigan added an alternative aesthetic to old Queen Street seven years ago this Saturday, with a gallery that offers a much different perspective than the predictable prints of The Battery and Rainbow Row. The Corrigan Gallery celebrates its 7th anniversary Saturday with an open invitation for art lovers to enjoy lemonade and explore creations of numerous artists whose images are consistently absorbing, thought-provoking, and inclined to push the envelope. Artists featured at the Corrigan Gallery include local surgeon Duke Hagerty, who was my next-door neighbor as a boy on Legare Street. 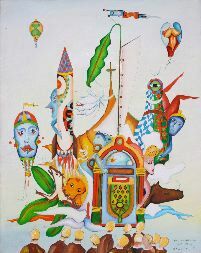 Duke’s art work is a delightfully chimerical blend of shape,color, and symbolism as his “Existential Jukebox” shows. In coordinating with the Charleston Fine Art Weekend in November, the Corrigan Gallery will present a show entitled “Over the Edge”, featuring some of the body of work that Lese has created over the past 25 years in Charleston. Other featured artists at the Corrigan Gallery include Karin Olah, Jennie Summerall, Paul Mardikian, and Gordon Nicholson. The gallery is at 62 Queen Street in the French Quarter, and is a great stop during the quarterly French Quarter Art Walks. Of the many colorful plants and trees that accentuate Charleston’s historic architectural beauty is the distinctive “Angel’s Trumpet”. This flower is very distinctive, blooming in the late Summer with massive, drooping orange petals in gardens such as the one at 31 Legare Street. 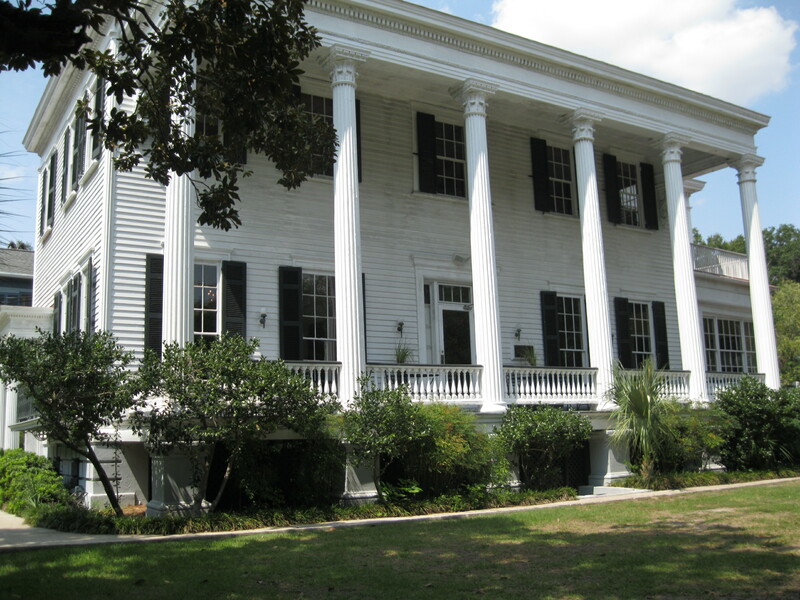 The House at 31 Legare dates to 1789, and is famously known for a the ghost of a man killed in a deer hunting accident centuries ago who supposedly haunts the drawing room with his presence. Ironically, the Angel’s Trumpet, whose scientific name is Brugmansia Sauveolens, is famous as an hallucinogen. It comes from tropical regions of South America, where it was boiled in teas by primitive tribes to create hallucinatory effects believed to link them to the afterlife. The flower was named for Dutch botanist Sebald Brugmans, and considering the Dutch propensity for getting high, this connection seems very appropriate. Brugmansia was not grown in North America until the mid 19th century, so some of the old Charleston ghost stories may have been induced by native hallucinogenic plants such as the Jimson weed, which once grew throughout the city. Apparently, cows, goats, and horses were grazing on the Jimson weed doing some might strange things in the streets, so the city passed and ordinance in the 1750’s requiring property owners to remove it under punishment of fines. 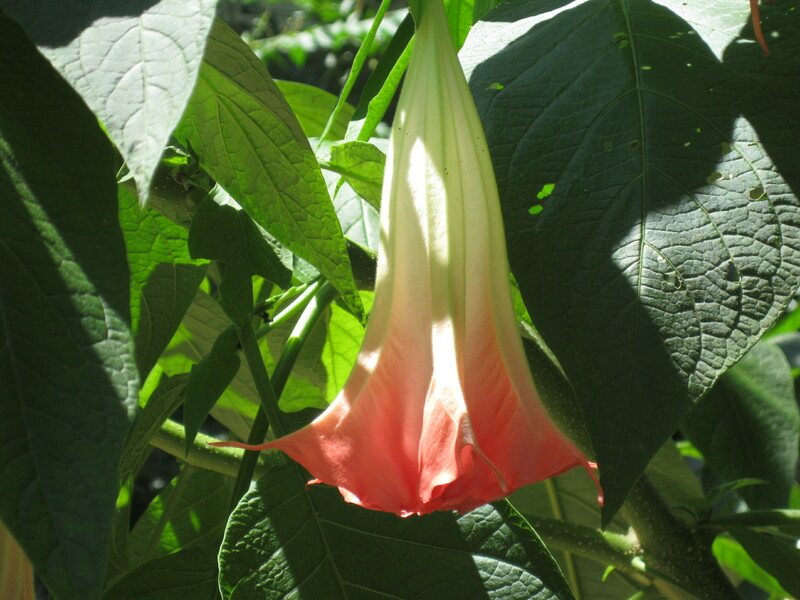 Fortunately, you won’t get fined for growing the Brugmansia in your Charleston yard. Just be warned that the hallucinations from ingesting this plant can be very unpleasant, and we don’t need any more ghosts in the old city. The Middleton-Pinckney House on George Street represents the high-water mark of Charleston wealth in the post-Revolutionary period, and ironically was literally pumping tons of water daily one hundred years later. 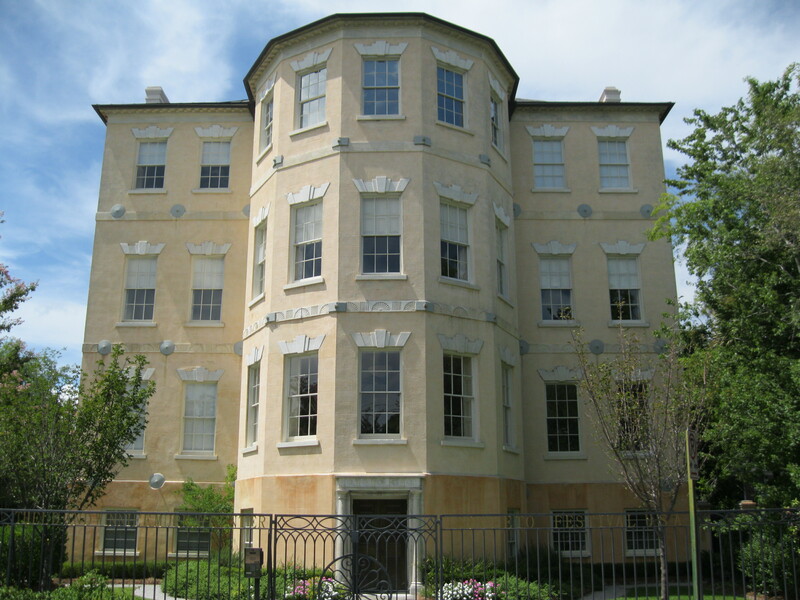 The 1796 Federal-style structure was built for wealthy widow Frances Motte Middleton, who later married Gen, Thomas Pinckney. Both came from powerful, influential families that prospered from rice plantations that made Charleston among the wealthiest cities in colonial America. The outer elegance would survive Civil War and Charleston’s economic decline, but the spacious interior was gutted for steam powered shafts that pumped water through pipe mains first created throughout the city by the early 1880’s, as the old mansion became home to the city water utility. Until the post-Civil War period, shallow wells and rainwater had been Charleston’s water supply, and the populace suffered from water-borne diseases spread by germs that festered in the city’s heat. A new artesian well system was successfully completed in 1878, allowing for the pumping of 3 million gallons daily from a huge reservoir behind the house. In 1933, a public swimming pool was built on the property, and was used until 1963. By that time, Charleston’s water supply was primarily derived from the Edisto River, but the artesian flow continued until the 1980’s when the underground aquifer dried up. The Middleton-Pinckney House is now home to administrative offices for Spoleto USA, Charleston’s annual international arts and music festival, and presumably it is a welcome signal from the past if the roof springs an occasional leak. Many people from long-time Charleston families have attended formal parties at the Wickliffe House on Ashley Avenue. The 1850 house is now property of the Medical University of South Carolina, and is rented out for weddings and other formal functions that rekindle memories of the grand balls that epitomized society in the antebellum South. The house was built by rice planter John Hume Lucas, whose family owned Hopsewee Plantation on the banks of the Santee River. 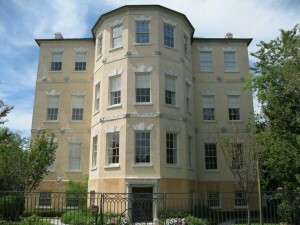 Hopsewee had been home to Thomas Lynch, Jr., signer of the Declaration of Independence, and was sold to Lucas in 1844. Like many wealthy rice planters, Lucas spent the hotter Summer months in Charleston to avoid the swarms of mosquitoes along the Santee River delta. When the Lucas(Wickliffe) house was built, it stood overlooking the Ashley River, and was cooled by the prevailing westerly breezes that blow through Charleston. Across the street, the Lucas family was entertained by marching soldiers at the Federal arsenal, which would later become home to Porter Military Academy, the now the Medical University. Although the waterfront area has long been filled in and is now crowded with towering hospitals and research facilities, the old house retains its antebellum aura with grand piazzas overlooking a still-substantial property, and inside, massive ballrooms where the cream of Charleston society once mingled. Doing some research the other day, I came across a letter written by Charlestonian Alicia Rhett in 1943. For those who are not familiar with Miss Rhett, she played India Wilkes in “Gone With The Wind”, and was a world-class portrait artist here in Charleston for many years from her Tradd Street home. When the new Dock Street Theatre was being constructed in 1936 on Church Street in the old Planters Hotel building, Miss Rhett was very much involved in the decorations and planning. Her letter describes the varying details she added to the theatre, which was replicated to look like the 18th century Dock Street Theatre that had disappeared after the Revolution. Miss Rhett personally hung drapes in the upstairs boxes and added artistic details to the theatre lobby, as well as creating the distinctive seal of King James VI featured above the stage curtain. The symbolic “order of the garter” includes the unicorn of Scotland and the Lion of England, representing the union of those countries in 1707, and is embellished with French slogans “Dieu et mon Droit” and “Honi sont qui mal y pense”, meaning “God and my right” and “Foolish are those who think badly(of others)”. The notable symbol was first displayed in the Charleston area at the old Goose Creek church in the early 1700’s, and was chosen for the Dock Street Theatre replication project as part of a myriad of motifs throughout the theatre property that incorporate classic architectural themes from Charleston’s past. By the way, Miss Rhett is still with us at age 98, now living in a nursing facility but, according to her nephew, still possessing the sharp mind that provided so many Charlestonians with lasting images of their families. Saturday August 4th marks one of Charleston’s most somber anniversaries – the hanging of Col. Isaac Hayne. A rice planter from Colleton County, Hayne was commissioned as an office in the South Carolina forces fighting for independence against the British. Hayne was among the thousands of soldiers trapped in Charleston during the second British siege in 1780, and was captured and paroled. Under the terms of parole, an officer was allowed to return to his home under the condition that he not take up arms again, under the punishment of death. But Hayne, who was an accomplished soldier with outstanding leadership, was put in an awkward position by the British in 1781, as fortunes were turning in favor of the Revolutionary cause in South Carolina. The English demanded that Hayne take up arms for the British, or be subjected to house arrest at his Walterboro plantation. Hayne chose the threat of death rather than change his convictions, and considered the British offer tantamount to violating the terms of parole, once again joining the American ranks. He was captured again, and held in the basement of the Exchange building at the foot of Broad Street that still stands today. Found guilty of treason, he was marched through the streets of Charleston to the gallows at White Point, encountering sobbing citizens along the way who begged the British not to hang one with such honorable standing in the city. Hayne’s hanging not only helped inspire South Carolina’s patriots to drive the British out within the year, it also gave rise to a famous ghost story. According legend, Hayne passed the house of his sister on the way to the gallows, and she called out to him to please come back to her. Her supposedly promised that he would return, and there have been claims that his boots can be heard marching down Broad Street at the dead of night.